This article is about the founder of Ferrari. For the automobile named after this man, see Enzo Ferrari (automobile). For the Italian footballer and manager, see Enzo Ferrari (footballer). For other uses, see Enzo Ferrari (disambiguation). Enzo Anselmo Giuseppe Maria Ferrari, Cavaliere di Gran Croce OMRI (Italian: [ˈɛntso anˈsɛlmo ferˈraːri]; 20 February 1898 – 14 August 1988) was an Italian motor racing driver and entrepreneur, the founder of the Scuderia Ferrari Grand Prix motor racing team, and subsequently of the Ferrari automobile marque. He was widely known as "il Commendatore" or "il Drake". In his final years he was often referred to as "l'Ingegnere" (the Engineer) or "il Grande Vecchio (the Great Old Man)". Ferrari was said to have been born on 18 February 1898 in Modena, Italy and that his birth was recorded on 20 February because a heavy snowstorm had prevented his father from reporting the birth at the local registry office; in reality, his birth certificate states he was born on 20 February 1898, while the birth's registration took place on 24 February 1898 and was reported by the midwife. He was the younger of two children to Alfredo Ferrari and Adalgisa Bisbini, after his elder sibling Alfredo Junior (Dino). Alfredo Senior was the son of a grocer from Carpi and started a workshop fabricating metal parts at the family home. Enzo grew up with little formal education. At the age of 10 he witnessed Felice Nazzaro's win at the 1908 Circuito di Bologna, an event that inspired him to become a racing driver. During World War I he served in the 3rd Mountain Artillery Regiment of the Italian Army. His father Alfredo, and his older brother, Alfredo Jr., died in 1916 as a result of a widespread Italian flu outbreak. Ferrari became severely sick himself in the 1918 flu pandemic and was consequently discharged from the Italian service. Following the family's carpentry business collapse, Ferrari started searching for a job in the car industry. He unsuccessfully volunteered his services to FIAT in Turin, eventually settling for a job as test-driver for C.M.N. (Costruzioni Meccaniche Nazionali), a car manufacturer in Milan, which rebuilt used truck bodies into small passenger cars. He was later promoted to race car driver and made his competitive debut in the 1919 Parma-Poggio di Berceto hillclimb race, where he finished fourth in the three-litre category at the wheel of a 2.3-litre 4-cylinder C.M.N. 15/20. On 23 November of the same year, he took part in the Targa Florio but had to retire after his car's fuel tank developed a leak. In 1920, Enzo joined the racing department of Alfa Romeo as a driver. In 1924, Ferrari won the Coppa Acerbo at Pescara, a success that encouraged Alfa Romeo to offer him a chance to race in much more prestigious competitions. Deeply shocked by the death of Antonio Ascari in 1925, Ferrari, by his own admissions, continued to race half-heartedly. Following the birth of his son Alfredo (Dino) in 1932, Ferrari decided to retire and to focus instead on the management and development of the factory Alfa race cars, eventually building up a raceteam of superstar drivers, including Giuseppe Campari and Tazio Nuvolari. This team was called Scuderia Ferrari (founded by Enzo in 1929) and acted as a racing division for Alfa Romeo. The team was very successful, thanks to the excellent cars, for example the Alfa Romeo P3 and to the talented drivers, like Nuvolari. In this period the prancing horse emblem began to show up on his team's cars. The emblem had been created and sported by Italian fighter plane pilot Francesco Baracca. During World War I, Baracca gave Ferrari a necklace with the prancing horse on it prior to takeoff. Baracca was shot down and killed by an Austrian aeroplane in 1918.. In memory of his death, Ferrari used the prancing horse to create the emblem that would become the world-famous Ferrari shield. Initially displayed on Alfa Romeos, the shield was first seen on a Ferrari in 1947. Alfa Romeo agreed to partner Ferrari's racing team until 1933, when financial constraints forced them to withdraw their support – a decision subsequently retracted thanks to the intervention of Pirelli. Despite the quality of the Scuderia drivers, the team struggled to compete with Auto Union and Mercedes. Although the German manufacturers dominated the era, Ferrari's team achieved a notable victory in 1935 when Tazio Nuvolari beat Rudolf Caracciola and Bernd Rosemeyer on their home turf at the German Grand Prix. In 1937 Scuderia Ferrari was dissolved and Ferrari returned to Alfa's racing team, named Alfa Corse. Alfa Romeo decided to regain full control of its racing division, retaining Ferrari as Sporting Director. After a disagreement with Alfa's managing director Ugo Gobbato, Ferrari left in 1939 and founded Auto-Avio Costruzioni, a company supplying parts to other racing teams. Although a contract clause restricted him from racing or designing cars for four years, Ferrari managed to manufacture two cars for the 1940 Mille Miglia, which were driven by Alberto Ascari and Lotario Rangoni. With the outbreak of World War II in 1940, Ferrari's factory was forced to undertake war production for Mussolini's fascist government. Following Allied bombing of the factory, Ferrari relocated from Modena to Maranello. At the end of the conflict, Ferrari decided to start making cars bearing his name, and founded Ferrari S.p.A. in 1947. Enzo decided to battle the dominating Alfa Romeos and race with his own team. The team's open-wheel debut took place in Turin in 1948 and the first win came later in the year in Lago di Garda. The first major victory came at the 1949 24 Hours of Le Mans, with a Ferrari 166M driven by Luigi Chinetti and (Baron Selsdon of Scotland) Peter Mitchell-Thomson. In 1950 Ferrari enrolled in the newly-born Formula 1 World Championship and is the only team to remain continuously present since its introduction. Ferrari won his first Grand Prix with José Froilán González at Silverstone in 1951. The story goes that Enzo cried like a baby when his team finally defeated the mighty Alfetta 159. The first championship came in 1952, with Alberto Ascari, a task that was repeated one year later. In 1953 Ferrari made his only attempt at the Indianapolis 500. In order to finance his racing endeavours in Formula One as well as in other events such as the Mille Miglia and Le Mans, the company started selling sports cars. Ferrari's decision to continue racing in the Mille Miglia brought the company new victories and greatly increased public recognition. However, increasing speeds, poor roads, and nonexistent crowd protection eventually spelled disaster for both the race and Ferrari. During the 1957 Mille Miglia, near the town of Guidizzolo, a 4.0-litre Ferrari 335S driven by Alfonso de Portago was traveling at 250 km/h when it blew a tyre and crashed into the roadside crowd, killing de Portago, his co-driver and nine spectators, five of whom were children. In response, Enzo Ferrari and Englebert, the tyre manufacturer, were charged with manslaughter in a lengthy criminal prosecution that was finally dismissed in 1961. Many of Ferrari's greatest victories came at Le Mans (9 victories, including six in a row in 1960–1965) and in Formula One during the 1950s and 1960s, with the successes of Juan Manuel Fangio (1956), Mike Hawthorn (1958), and Phil Hill (1961). Enzo Ferrari's strong personality and controversial management style became notorious in 1962. Following a rather pale title defence of Phil Hill's 1961 world title, sales manager Girolamo Gardini, together with manager Romolo Tavoni, chief engineer Carlo Chiti, sports car development chief Giotto Bizzarrini and other key figures in the company left Ferrari to found a rival car manufacturer and racing team, Automobili Turismo e Sport (ATS). Based in Bologna, and financially supported by Count Giovanni Volpi, ATS managed to lure away Phil Hill and Giancarlo Baghetti from Ferrari, who responded by promoting junior engineers like Mauro Forghieri, Sergio Scaglietti and Gian Paolo Dallara, and hiring Ludovico Scarfiotti, Lorenzo Bandini, Willy Mairesse and John Surtees to drive his Formula One cars. The "great walkout" came at an especially difficult time for Ferrari. At the urging of Chiti, the company was developing a new 250-based model. Even if the car would be finished, it was unclear if it could be raced successfully. Ferrari's shakeup, however, proved to be successful. The mid-engined Dino racers laid the foundation for Forghieri's dominant 250-powered 250 P. John Surtees won the world title in 1964 following a tense battle with Jim Clark and Graham Hill. The Dino road cars sold well, and other models like the 275 and Daytona were on the way. Conversely, ATS, following a troubled Formula One 1963 campaign, with both cars retiring four times in five races, folded at the end of the years. In 1998, Tavoni declared in an interview that he and the rest of Ferrari's senior figures didn't leave out of their own initiative but were ousted following a disagreement with Ferrari over the role of his wife in the company. "Our mistake was to go to a lawyer and write him a letter, instead of openly discussing the issue with him. We knew that his wife wasn't well. We should have been able to deal with it in a different way. When he called the meeting to fire us, he had already nominated our successors”. By the end of the 1960s, increasing financial difficulties as well as the problem of racing in many categories and having to meet new safety and clean air emissions requirement for road car production and development, caused Ferrari to start looking for a business partner. 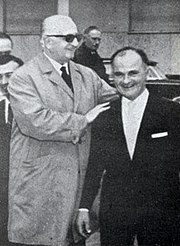 In 1969 Ferrari sold 50% of his company to FIAT, with the caveat that he would remain 100% in control of the racing activities and that FIAT would pay sizable subsidy till his death for use of his Maranello and Modena production plants. Ferrari had previously offered Ford the opportunity to buy the firm in 1963 for US$18 million but, late in negotiations, Ferrari withdrew once he realized that Ford would not agree to grant him independent control of the company racing department. Ferrari became a joint-stock company, and FIAT took a small share in 1965. In 1969 FIAT increased their holding to 50% of the company. (In 1988 FIAT's holding rose to 90%). Following the agreement with FIAT, Ferrari stepped down as managing director of the road car division in 1971. In 1974 Ferrari appointed Luca Cordero di Montezemolo as Sporting Director/Formula One Team manager. (Montezemolo eventually assumed the presidency of Ferrari in 1992, a post he held until September 2014). Clay Regazzoni was deputy champion in 1974, while Niki Lauda won the championship in 1975 and 1977. After those successes and another title for Jody Scheckter in 1979, the company's Formula One championship hopes fell into the doldrums. In the early 1970s, Ferrari, aided and abetted by fellow-Modena constructors Maserati and Automobili Stanguellini, demanded the Modena Town Council and Automobile Club d'Italia to upgrade the Modena Autodrome, the reasoning being that the race track was obsolete and inadequate to test modern racing cars. The proposal was initially discussed with interest, but eventually stalled due to lack of political will. Ferrari then proceeded to buy the land adjacent to his factory and build the Fiorano Circuit, a 3000 metres long track still in use these days to test Ferrari racing and road cars. In 1981 Ferrari attempted to revive his team's fortunes by switching to turbo engines. In 1982, the second turbo-powered Ferrari, the 126C2, showed great promise. However, driver Gilles Villeneuve was killed in an accident during the last session of free practice for the Belgian Grand Prix in Zolder in May. In August, at Hockenheim, teammate Didier Pironi had his career cut short in a violent end over end flip on the misty back straight after hitting the Renault F1 driven by Alain Prost. Pironi was leading the driver's championship at the time; he would lose the lead as he sat out the remaining races. The Scuderia went on to win the Constructors Championship at the end of the season and in 1983, but the team would not see championship glory again before Ferrari's death in 1988. The final race win for the team he saw was when Gerhard Berger and Michele Alboreto scored a 1-2 finish at the final round of the 1987 season in Australia. Ferrari's management style was autocratic and he was known to pit drivers against each other in the hope of improving their performance. Some critics believe that Ferrari deliberately increased psychological pressure on his drivers, encouraging intra-team rivalries and fostering an atmosphere of intense competition for the position of number one driver. "He thought that psychological pressure would produce better results for the drivers," said Ferrari team driver Tony Brooks. "He would expect a driver to go beyond reasonable limits... You can drive to the maximum of your ability, but once you start psyching yourself up to do things that you don’t feel are within your ability it gets stupid. There was enough danger at that time without going over the limit." In public Ferrari was careful to acknowledge the drivers who risked their life for his team, insisting that praise should be shared equally between car and driver for any race won. However, his longtime friend and company accountant, Carlo Benzi, related that privately Ferrari would say that "the car was the reason for any success." Following the deaths of Giuseppe Campari in 1933 and Alberto Ascari in 1955, both of whom he had a strong personal relationship with, he chose not to get too close to his drivers, out of fear of emotionally hurting himself. In his later years, Ferrari rarely left Modena, and never went to any Grands Prix outside of Italy; he was usually seen at the Grands Prix at Monza near Milan and/or Imola, which wasn't far from the Ferrari factory, and was named after the late Dino. 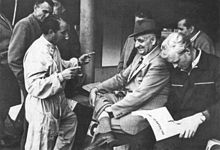 Enzo Ferrari spent a reserved life, and rarely granted interviews. He rarely left Modena and Maranello, except for when the annual Italian Grand Prix at Monza just outside Milan took place, or when he took a trip to Paris to broker a compromise between the warring FISA and FOCA parties in 1982. He never flew in an aeroplane, never travelled to Rome and never set foot in a lift. He married Laura Dominica Garello (c. 1900–1978) on 28 April 1923, and they remained married until her death. They had one son, Alfredo "Dino", who was born in 1932 and groomed as Enzo's successor, but he suffered from ill-health and died from muscular dystrophy in 1956. Enzo had a second son, Piero, with his mistress Lina Lardi in 1945. As divorce was illegal in Italy until 1975, Piero could only be recognized as Enzo's son after Laura's death in 1978. Piero is currently a vice-president of the Ferrari company with a 10% share ownership. Made a Cavaliere del Lavoro in 1952, to add to his honours of Cavaliere and Commendatore in the 1920s, Ferrari also received a number of honorary degrees, the Hammarskjöld Prize in 1962, the Columbus Prize in 1965, and the De Gasperi Award in 1987. In 1994, he was posthumously inducted into the International Motorsports Hall of Fame. He was inducted into the Automotive Hall of Fame in 2000. Ferrari died on 14 August 1988 in Maranello at the age of 90. His death was not made public until two days later, as by Enzo's request, to compensate for the late registration of his birth. He witnessed the launch of the Ferrari F40, one of the greatest road cars at that time, shortly before his death, which was dedicated as a symbol of his achievements. In 2002 the first car to be named after him was launched as the Enzo Ferrari. The Italian Grand Prix was held just weeks after Ferrari's death, and the result was a 1–2 finish for Ferrari, with the Austrian Gerhard Berger leading home Italian and Milan native Michele Alboreto; it was the only race that McLaren did not win that season. After Ferrari's death, the Scuderia Ferrari team has had further success, winning the World Drivers' Championship in 2000, 2001, 2002, 2003 and 2004 with Michael Schumacher, 2007 with Kimi Räikkönen and Constructors' Championship in 2008. The 2003 film Ferrari was based on his life. In April 2015, Robert De Niro declared his interest in playing Enzo Ferrari in a biopic. In August 2015, Christian Bale was reported to be playing Enzo Ferrari but left on January 15, 2016 due to health concerns. In March 2017, Hugh Jackman replaced Bale to play Enzo in Michael Mann's biopic. ^ informatici, Segretariato generale della Presidenza della Repubblica - Servizio sistemi. "Il sito ufficiale della Presidenza della Repubblica". quirinale.it. Retrieved 30 December 2016. ^ "Enzo Ferrari's Birth Certificate at Antenati. Italia, Modena, Stato Civile (Archivio di Stato), 1806-1942". ^ "Enzo Ferrari (I)". imdb.com. Retrieved 2012-11-18. ^ "History of Enzo". Ferrari GT - en-EN. ^ Buckland, Damien (2015-02-04). Collection Editions: Ferrari In Formula One. Lulu Press, Inc. ISBN 9781326174880. ^ McDonough, Ed (November 2008). "Road to Nowhere - ex Phil Hill 1963 ATS F1". Vintage Racecar. 11 (11): 38–48. ^ Noble, Jonathon, and Hughes, Mark. Formula One Racing for Dummies (John Wiley & Sons, 2004), p.81. ^ "F1 Beyond The Grid Podcast with former Ferrari President Luca Di Montezemolo | Formula 1®". www.formula1.com. Retrieved 2019-04-02. ^ Pritchard, Anthony (2009). Ferrari: Men from Maranello. Haynes Publishing. p. 98. ISBN 978-1-84425-414-9. ^ Pritchard, Anthony (2009). Ferrari: Men from Maranello. Haynes Publishing. p. 100. ISBN 978-1-84425-414-9. ^ Pattni, Vijay (10 April 2015). "De Niro to play Ferrari". BBC. ^ "Robert De Niro to play legendary Enzo Ferrari in 'movie epic'". Motorsport.com. ^ Anthony D'Alessandro; Mike Fleming Jr. "Michael Mann Revs 'Ferrari' With Hugh Jackman & Noomi Rapace". Deadline. Retrieved 8 March 2017. Dal Monte, Luca (2018). Enzo Ferrari. Power, Politics, and the Making of an Automotive Empire. David Bull Publishing. Williams, Richard (2011). Enzo Ferrari: A Life. Random House. ISBN 1-4464-5037-6. Wikimedia Commons has media related to Enzo Ferrari.